Give an immediate modern and bold look to your trendy decor with this printable positive colors poster! 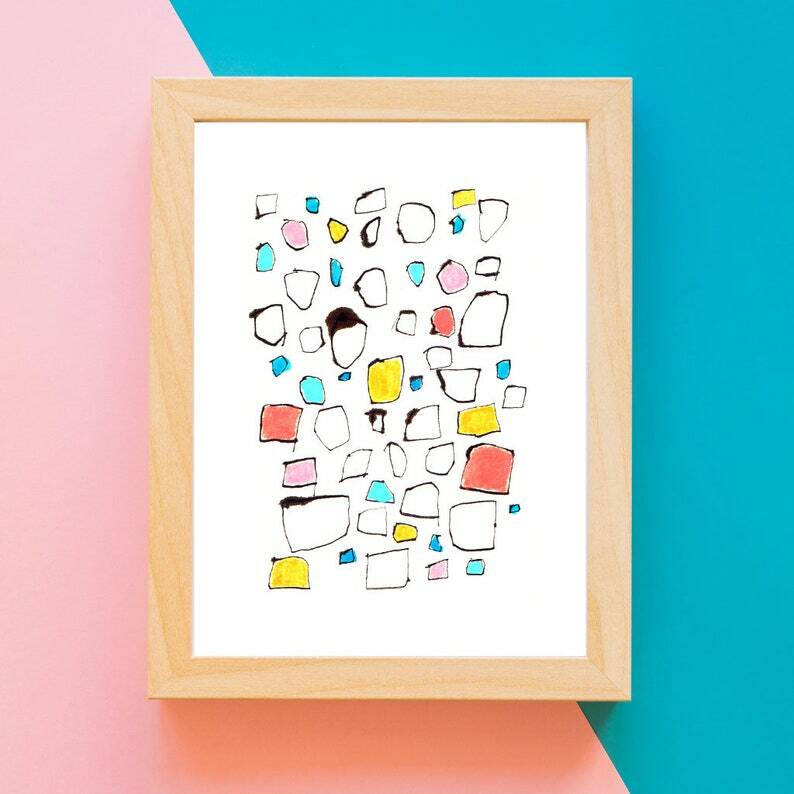 This geometric print is part of my large collection of unique hand-made original paintings and drawings. It is a reproduction of one of my original small paintings collection. I have carefully photographed, scanned and edited the image so you can have access to an excellent print quality. This is not a digital work made on a computer, and you can see details of the original paper texture and even tiny spots on the original drawing, what you are buying is a reproduction of an actual artwork made with paint, inks or pencils. NO ITEM WILL BE SENT TO YOU BY POST, this is a DIGITAL DOWNLOAD. After your purchase, your will instantly receive 1 file (check your email or check your purchases on etsy, the file will be there). This file is very good quality at 300 dpi, it can be sized down when printed without losing quality. The size of the file is to print up to A4 - 8"x11" format or less. For the best results, you may take your purchased file to a professional print shop. I suggest printing on matte textured paper of 250 gms - 170 lbs or more. I suggest the same paper if you are going to print on inkjet or laser at home. I recommend to print on the sizes detail above and no more than that. In any case, please ask to the professional printer if it is possible to print larger, they can check the file. The quality of the final print is directly related to quality of the paper and kind of printer that you use. Take in consideration that computer monitors and printers are calibrated in different ways and the colors of the print may differ slightly from the colors that you see on your screen. All of the original and downloadable artwork purchased from BeaMahan is for personal use only. Do NOT share these files, sell, distribute, or publish in any format (digital or printed). Please encourage others to support independent artists! Downloadable items are NOT REFUNDABLE. It adds a character and charm to our house! I love this little blue and it fits very well with my other etchings! perfect and very fast service! thanks a lot!! Beautiful etching. Well packaged and swiftly send. Great shop. Lovely booklet, well made. Swiftly send, well packaged. Very happy with it. You can pay with any credit card or via Paypal. Sorry, I can not accept returns because it means an extra cost for you and damage for the work. Please ask me for more details about any work before submitting your order. I will be very glad to answer all your questions and send more detailed pictures if necessary. However, I will be responsible for losses or severe packaging damages by the mail. If this occur, I will be very glad to give you the choice of choosing another item, send it again (if copies are available) or a refund (via the chosen payment when placing the order). Most of the work shown here is original hand-made work. There may be slight variations in color due to the computer monitor type in which you see the work. For more detailed information about the colors and papers, as well as extra photographs, do not hesitate to contact me before purchase. In some of my collages and paintings, you will find some spots or paintings marks on the back of the work, because of the spontaneous way they were created. Hand pulled prints are spotless on the back unless specified. In the case of prints whose print run is greater than 1, it is natural to notice some kind of difference, as they are hand pulled printed. If you need extra pictures of a special print number, please let me know. Works on paper are very sensitive to humidity and light, so I recommend storing them flat in a dry environment and/or display them away from a direct sun light exposure and make them frame by a professional. ***CARDBOARD TUBE: If you buy a large item, I will probably send it rolled on a cardboard tube. It is very important that you take it out very carefully immediately after arrival and place it flat under some pressure (with tissue paper on it). It will recover its flat shape in a couple of days. You can accelerate this process by placing it between slightly humid blotting paper sheets. Please contact me for further information. Thank you very much for supporting my work!